There will be no ‘sleeping lions’ at the West Midland Safari Park now that its sea lions will be jumping at great height! 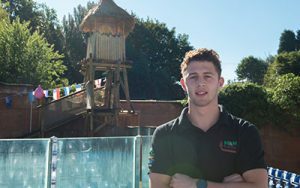 Children, parents and visitors will be amazed as they watch sea lions entertain the crowds from a new tower overlooking the sea lion enclosure – and its thanks to M&M Timber that the construction has been possible. Leading timber manufacturer, M&M Timber located locally to the adventure park in the village of Clows Top near Kidderminster, has supplied the wood for the structure. It has provided its Playguard Radiata posts and Agripost rounds. All of the timbers were supplied straight cut, the machining for the drill holes was done on site by the safari park and then the installation was carried out by the safari parks maintenance team. Now that the structure is in place, visitors can enjoy sea lion shows throughout the day; at the very top of the structure there is a standing platform for one of the sea lion trainers to talk to the audience during the show and below that is a raised platform for the sea lions to jump off into the water. For more than 30 years M&M Timber has supplied a wide range of timber products to the playground and leisure equipment industry throughout the UK, specifically for educational and play structures and other outdoor leisure applications. The PlayGuard range has been developed using Radiata pine, which has low-split levels and presents endless opportunities in terms of innovative design, durability and ease of maintenance. PlayGuard timbers are kiln dried and pressure treated with celcure Tanalith E wood preservative to increase resilience and longevity. “West Midland Safari Park contacted us initially as they needed to do repair works to the existing structure – and we were thrilled to be able to assist in developing the new tower. We responded proactively to the requests and were able to have timbers ready in 3 weeks from the date of order! The West Midland Safari Park is one of the greatest local attractions in our area and hundreds of visitors walk through the park every week enjoying the exotic sights and wildlife experience.